Note: The restaurant has changed management and name. Read about it – Marrakech. A couple of weeks back, my BFF Kevin and I stepped into a new Moroccan restaurant in the Adams Morgan area to review its performance. Simple verdict – disappointing. The dishes were poorly cooked with barely edible stringy meat, the orders were mixed up, and the food was swimming in a pool of oil. To make matters worse, Kevin got sick from the food for the next few days – poor bugger! I was hoping that this visit was going to be en par with a recent visit to another Moroccan eatery in the Dupont Circle area. Some friends and I had originally planned to have brunch in another location on the same street on a freezing Sunday afternoon. After being told that the wait was around 40 minutes and in the state of famish that we were in, we hauled ourselves down the street and walked through the doors of Marrakesh P Street Restaurant. It is located on the former spot of a seedy gay bar that was renowned for its campy drag shows. However, with some dramatic cosmetic transformation (yes, pun intended), the location has taken on a new look and feel, far from its former life. Walking into the foyer, you are immediately whisked away to North Africa with its terra-cotta colored and tiled walls, plush deep-red velvet cushions on a sitting area, and exotic brass ware everywhere including the perforated overhead light fixtures. The dining rooms are divided into the lower casual eating section and the upper “blue room” reserved for dinners. Small mosaic fountains and large urns are placed around the space evoking a sense of distant exoticism and beauty. Perusing the menu, the dishes are divided into simple and understandable sections: Hot Tapas, Cold Tapas, Couscous, Tagines, and Brochettes. It is rare that you will come across a restaurant that is open for lunch on Sunday and offering a 3-course lunch special ($12.95) on the weekend. The first course is a choice of Harira soup or a salad – I chose the soup, suitable for the cold weather. 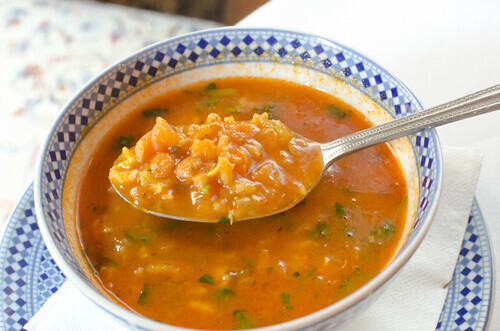 This traditional soup is made with tomato, lentils, chickpeas, bulgur wheat (I suspect), saffron, cilantro and ginger. With the first spoonful, the broth tasted rich and complex from the spices and herbs, while the grains and beans added body and heartiness to this wonderful starter – just the perfect entrance to this exotic cuisine. On another visit, I decided to try a medley of cold tapas as the starter – the Combo Salad. It arrived with spinach that had been cooked with garlic and preserved lemon; roasted eggplant cooked with fresh tomato, garlic and cilantro; and a carrot salad prepared with garlic, cilantro, and preserved lemon. This trio was very flavorful, and the dish points to a kitchen that takes great care in its dish preparation. There was a level of soulfulness in these simple vegetables that matched perfectly with the crusty yet fluffy Moroccan traditional bread that provided the willing backdrop and vehicle to the savory vegetable dips. For the hot tapas, I decided to go the traditional route and order one of Morocco’s most recognizable dishes – Chicken Pastry or Bastilla. 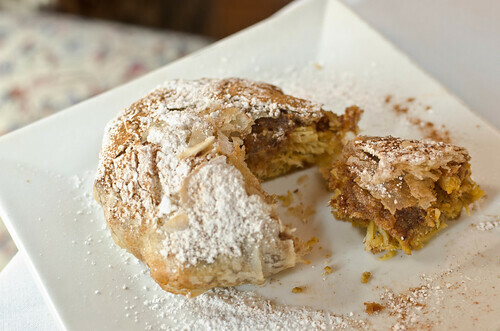 Baked Phylo dough has been stuffed with a mixture of chicken, egg, and almonds, topped with a dusting of powdered sugar and cinnamon. This concoction is a study of contrast between the crispy dough and the rather moist filling, the sweet and savory flavors, with the hint of cinnamon adding a certain exotic earthiness to this appetizer. I have eaten various versions of this dish over the years and although the stuffing was a bit dry (the traditional use of pigeon would make it more moist), it was definitely well-made and worth every bite that I enjoyed. 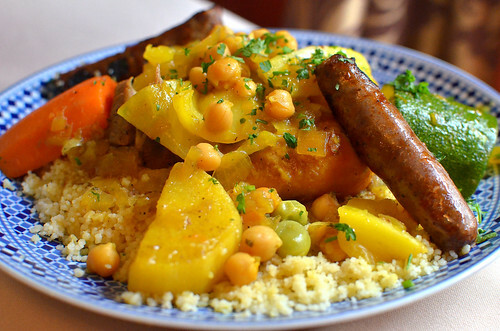 Moroccan cooking is renowned for its Tagine dishes that have been cooked in domed clay pots. With this in mind, I decided to order the Chicken Tagine that was part of the 3-course lunch special (the other choice was Vegetable Couscous). 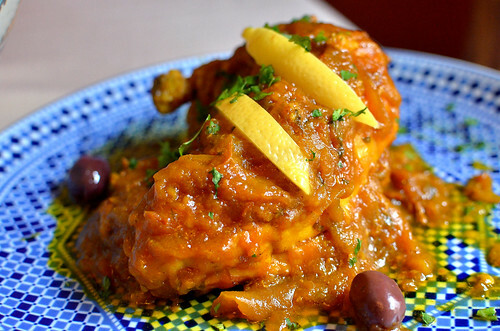 The breast was cooked in a sauce that was flavored with pickled lemons, olives, and a cornucopia of exotic spices that made the sauce very flavorful and delectable, enough for me to wipe up every drop with the spongy bread. The slices of pickled lemon rind and olives added the brininess and fruit-like notes to the already flavor-packed dish. I have had this dish before in other restaurants and this rendition was perhaps one of the best that I have eaten. For the Couscous section, my dining companion ordered the Couscous Royal. Sitting on a bed of the perfectly steamed pasta grains were spicy Merguez lamb sausage, chicken, lamb, zucchini, squash, carrots, chickpeas and fava beans. The pieces of meat cooked in a tasty broth were fork-tender, along with the well-cooked large pieces of sweet vegetables that were quite soft but not mushy. A few forkfuls from this dish confirmed to me that the kitchen really cares about the cooking and is skilful in preparing these traditional Moroccan dishes. This is another must-order from the menu along with the Chicken Tagine. The final course for the lunch special was a Fruit Cocktail. In most places, such dessert would be a banal mix of fruits that would leave the taster rather nonplussed. However, this restaurant’s version was a mixture of fresh cantaloupe, melon, pineapple, sweet strawberries, and plump blackberries. 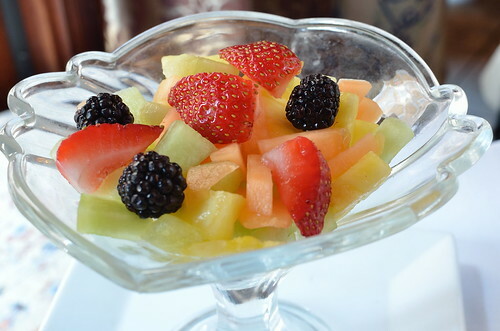 It is indeed refreshing to have a fresh fruit salad that has been slightly sweetened by a light syrup perfumed by a heady orange blossom water, especially in the midst of winter. The traditional dessert of Moroccan pastries were not available during the last visit, but I have enjoyed such dessert fare there in the past and the sweets were good. A cup of the customary sweet mint tea was also a perfect end to this wonderful meal. 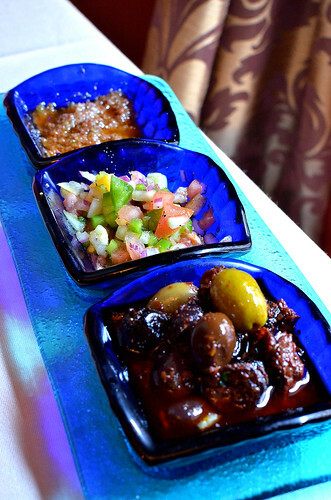 The dishes that I tasted at Marrakesh P Street Restaurant were a far cry from those that I tried at the other eatery mentioned in the opening paragraph, which will remain nameless and unreviewed. However, here the dishes were flavor-packed, skillfully executed, and full of Moroccan tasty exoticness. 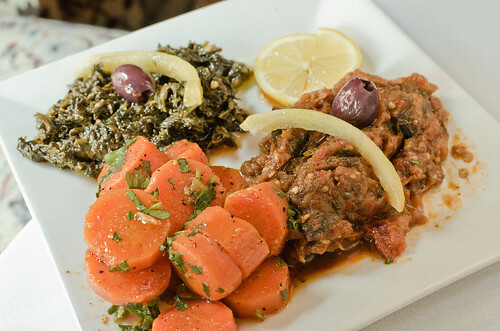 With this Northern African soul food, this restaurant managed to stir my taste buds and whole being with its traditional offerings that Moroccan cuisine is known for, very much like a belly dancer with her exotic, smooth, and alluring gyrations. But unlike its former life as a drag show venue, this restaurant truly delivers the real McCoy, at least food wise. I will indeed be revisiting this place in the future for more of the real stuff found in its wonderful authentic offerings. This all looks so delicious. Your photos are really gorgeous! Thank you! I strive for do justice to the food with the photos. You know, bastilla is served in Morocco for special occasions and on special holidays. And it’s a dish that the well-off enjoy. Rather economical, it’s a good thing we can enjoy that at Moroccan restaurants on this side of the Atlantic. Great review, inviting photos as usual, and having passed by Marrakesh P Street without going in, I have now enjoyed it vicariously through your write-up. Oh, and I think I know of the other restaurant you mentioned in the first paragraph. I found your review very informative and positive, once I got into it. Based on your recommendation, which corroborates some other reviews, I now plan to dine at Marrakesh. However, I almost brushed by the review after reading into the first paragraph. 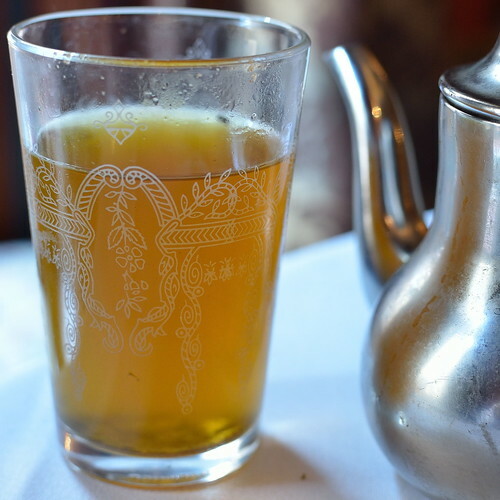 You start off talking about another restaurant that you did not like, but as the negative comments went on, it sounded like you were talking about Marrakesh. Luckily I read on. I’m an editor, and my professional opinion is that you should just delete the part about the other restaurant, which you hated and didn’t name anyway, and start talking right away about the wonderful restaurant you ARE reviewing. I recognize that you were trying to do a creative set-up for the review proper, but for me it was slightly confusing. Otherwise, your review is beautifully written and amazingly detailed. I love all the photos. Thank you for your constructive criticism on this review. I knew I was taking a chance opening up the blog with the forementioned paragraph. I will avoid such confusion in the future per your expertise on this matter. I have a question. I have been writing about the history of my people and their cuisine for the last 12 years, hoping to publish it soon. Do you happen to know anyone, including yourself, who could steer me in the right direction, writing wise and in the area of publication? I would appreciate your kind thoughts. Thanks. i am confused. So Marrakesh DC @ 617 New York Avenue(marrakeshdc.c om website stillworks) owned by the Kouchacjis closed bc it was sold bc it was prime real estate. 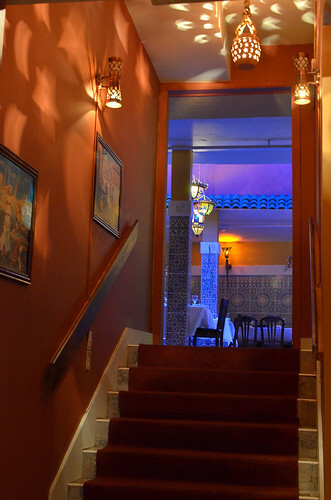 It reopened with same owners @ 2147 P street in Dupont Circle as Marrakesh Palace/ Marrakesh P Street. It is now called Marrakech with a c (marrakechrestaurantdc.com) and is still in Dupont Circleon P street. Marrakesh P St opened while Marrakesh NY Ave was still in business, and from my understanding, they were not related to each other at all. Since then it has changed hands. I really enjoyed the cooking there last year – please check out my blog on the place. Thanks for your comment. Hello. Yes I read your review of it. The review has me wanting to go to Oxon Hill for a gerard cake! Whose hands has Marrakesh P St changed to,the Kouchacjs ? Can you tell me more about yourself and how did you find my blog? Thanks.